HRH & Capt.D. Evans, RFA Resource 1969. 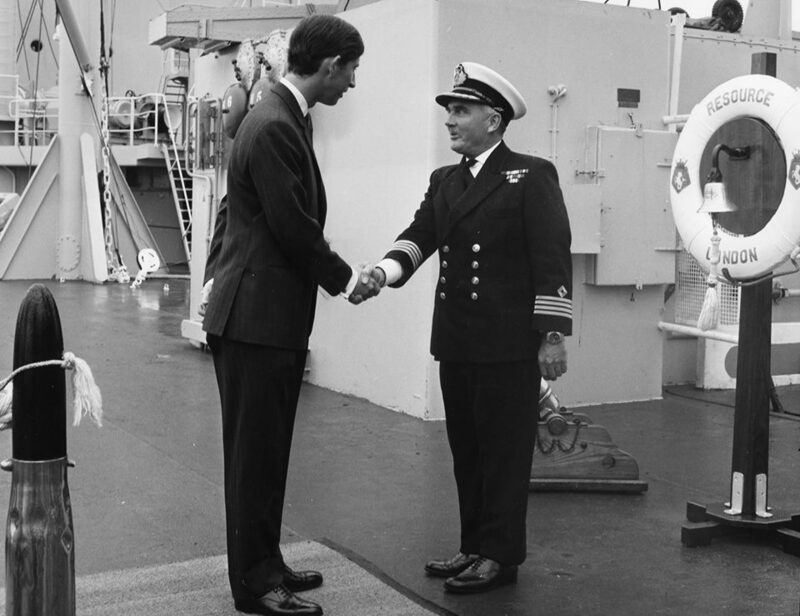 HRH Prince of Wales arrives on board RFA Resource at Torbay, July 1969, greeted by Captain David Evans. First ever visit by the Prince of Wales to an RFA, and Resource had the distinction of being the first ever ship to fly his personal standard, during his visit. Memories from Capt.R.Cooper who was at the 1969 Review: "Sadly it rained all day and no wind so we did not get any proper record of the standard as it never flew clear. Captain David was determined to get a photo of this (he was a keen photographer) so rather cheekily we held on to it for some weeks. On a suitable day later at sea we had to arrange to hoist the standard again and rig limited dressing lines leading away from the mast to mimic the occasion - and David was then a happy Capt!"